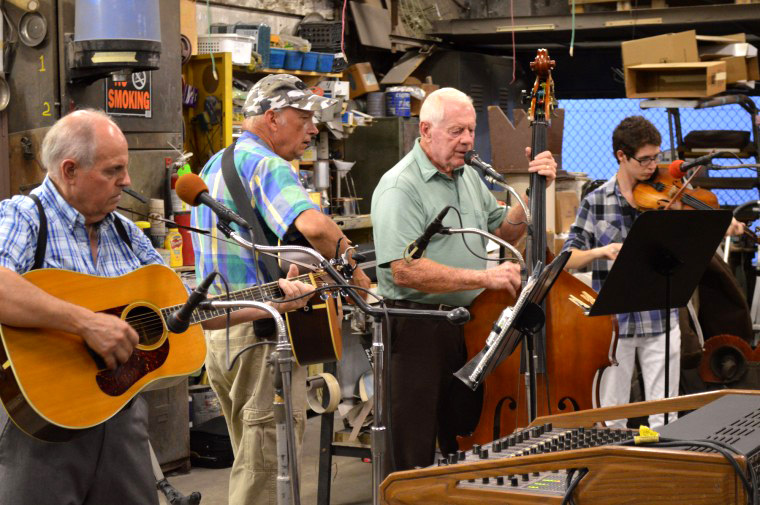 For more than 40 years—ever since Wayne Willis discovered that he could play the guitar and wanted some people to play with—Wayne’s Body Shop in Portsmouth, Virginia, has hosted a regular jam session. Just about everyone who can play old-time, country, bluegrass, or gospel music in southeastern Virginia and northeastern North Carolina has jammed at Wayne’s. The first rule is that there is no hierarchy and no noninclusion; everyone gets a chance to participate. This according to “Saturday night at Wayne’s Body Shop in Portsmouth, Virginia” by Dan Margolies (The old-time herald IX/3 [Spring 2004] pp.14–18). Above and below, Saturday night at Wayne’s.